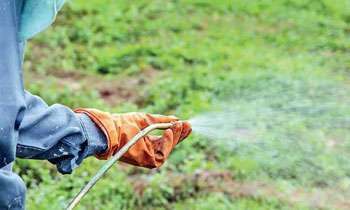 The ban on the Glyphosate weedicide has been lifted for tea and rubber industries with effect from today following the approval of President Maithripala Sirisena and Prime Minister Ranil Wickremesinghe, Plantation Industries Minister Navin Dissanayake said. Minister Dissanayake told a news conference that the government had reached this decision considering the economic damage the ban had caused to the tea and rubber sectors. “The economic damage it has done was too excessive and also there were no real scientific evidence to link Glyphosate with chronic kidney disease of unknown etiology (CKDu). Accordingly, the ban was lifted for tea and rubber industries,” he said. “The government is planning to replace Glyphosate with an organic herbicide within the next 3-4 years,” he added. He said the estimated loss of annual yield for the tea industry was Rs. 33.2 million while reduction of export earnings was estimated to be Rs 26.7 billion per year with the ban on Glyphosate. Finally. Govt should apologize to the nation for the massive damage done by this idiotic ban during last 3 years. It is Mr Sirisena rhat should apologise. One foot forward, two feet backward. Glyphosate ( Round-Up ) is necessary for the controll of obnoxious grass such as Couch and Iluck , specially on Tea and Rubber Plantations. Another instance of a man in Saffron Robes misusing the robe to upset a practice that existed for yearss without any scientific evidence.This was a matter for the scientists however in paradise all are experts and adhoc decisions have done a lot of harm. Ok. Now since farmers want it so much, why not mix it into their drinking water and give em a good dose first! So a miracle has happened and its ok ..Choice was made as to what was more helpful to the economy and it does not impact humans living in the vicinity ..then why reverse with an alternative in 3 or 4 years? This means tha Japan is going to take stirn and harsh measures to screen food exports..